LAWRENCEVILLE, Ga. (June 22, 2015) – Jive along to the brassy beats of Beale Street in 1950s Memphis, where the birthplace of rock ‘n’ roll reels in an aspiring R&B DJ, who just happens to be white, to spark change in the deep South. 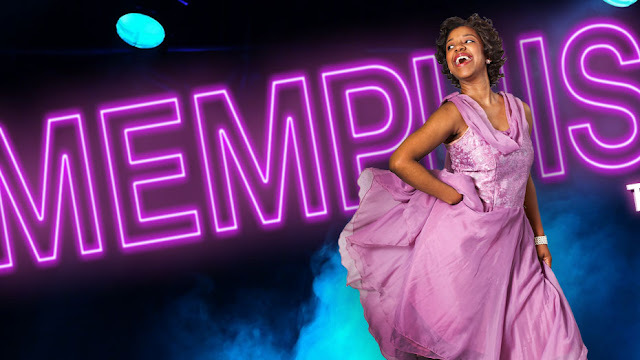 Bringing powerhouse numbers to the suburban Atlanta stage, Aurora Theatre debuts its 20th Anniversary Peach State Federal Credit Union Signature Series with the regional premiere of the hit-musical sensation Memphis, playing July 23- August 30, 2015! A co-production with Theatrical Outfit, this tuneful tale is sure to strike a chord with music lovers of all ages! Loosely based on real-life rock ‘n’ roll pioneer Dewey Phillips, Memphis follows the story of quirky and irreverent DJ Huey Calhoun and his transformation of the iconic sound from the radio to the TV. Breaking racial barriers along his journey, he falls in love with a soulful black singer and a cultural revolution is ignited! Winner of four 2010 Tony Awards including Best Musical, this story of passion, determination and sacrifice presents a moving musical for all to cheer for. Memphis boasts an original score by Bon Jovi’s founding member and keyboardist David Bryan with book and lyrics by three-time Tony Award-winner Joe DiPietro. At the helm of this production are three of the region’s top arts leaders; directed by Theatrical Outfit Artistic Director Tom Key, musical direction by Aurora Theatre Co-Founder and Associate Producer Ann-Carol Pence and choreography by Ballethnic Dance Company Artistic Director Waverly Lucas. Leading a 25-member company of Atlanta’s best performers, this is a spectacle of powerful, roaring rock ‘n’ roll melodies, exuberant dance sequences and not-to-be-missed production values. Memphis is presented at Aurora Theatre, July 23- August 30, 2015. Two discount weekday matinees will be offered on Wednesday, August 12 and 19 at 10 a.m. for $20-$30 per person. Regular show time tickets can be purchased starting July 1 for $30-$65 per person online at tickets.auroratheatre.com or by calling the Box Office at 678-226-6222. Season tickets and group tickets are currently on sale. · Wednesday – Friday: 8 p.m.
· Saturday: 2:30 p.m. and 8 p.m.
Our co-production of Memphis will continue September 10-20, 2015 at The Rialto Center for the Arts (80 Forsyth St., Atlanta, GA 30303) with tickets available from Theatrical Outfit online at www.theatricaloutfit.org/shows/memphis or by phone at 678-528-1500. Now in its 20th Season, Aurora Theatre produces professional live entertainment to suit everyone’s taste. Aurora Theatre is home to over 600 events each year. Two series of theatrical productions, the Peach State Federal Credit Union Signature Series and the GGC Harvel Lab Series, are comprised of the biggest Broadway plays and musicals alongside exciting contemporary theatre. Additionally, Aurora produces concerts, stand-up comedy, children’s programs, metro Atlanta’s top haunted attraction Lawrenceville Ghost Tours, as well as Atlanta’s only professional Spanish language theatre. Aurora Theatre is a world class theatrical facility with two performance venues. Nestled on the square in historic downtown Lawrenceville, Aurora has FREE attached covered parking and is surrounded by restaurants and shops. Aurora Theatre has garnered numerous accolades highlighted by recent achievements that include winner of Seven 2013 Suzi Bass Awards, Creative Loafing’s “2010 Best Theatre Company,” Georgia Trend Magazine’s “2011 Best Places to Work in Georgia,” Atlanta Business Chronicle’s “2012 Best Places to Work”, Atlanta Magazine’s “Best of Atlanta 2013,” Georgia Hispanic Chamber of Commerce’s 2014 President and CEO Award for Excellence in Arts and the Gwinnett Chamber 2015 IMPACT Regional Business Award for Hospitality.